This weekend, Dan and I took our nephew to Dillner Family Farm in Gibsonia probably during the hottest couple of hours of the entire weekend. We toured the farm, including fields of lettuce, eggplant, bell peppers, tomatoes and cucumbers. We get a CSA share (Community Supported Agriculture) from the Dillners every week, and in addition to the peaches and blueberries I picked up on Thursday, we were able to pick our own blueberries right from the blueberry bushes on the farm. Did you know blueberry bushes have to grow for three years before you can harvest the fruit? I had no idea! Our nephew loved picking the berries (“boo babies” in two year old speak), and they were so delicious eaten right from the bush, warmed in the sun. Each one was a burst of pure blueberry flavor. I made this cobbler on Sunday afternoon to marry the ripe, juicy peaches with the sweet, tangy blueberries. 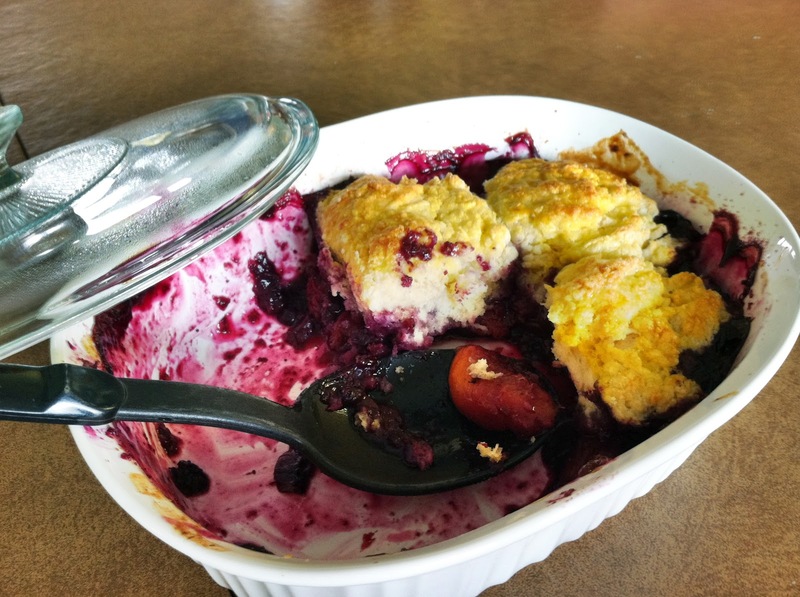 The recipe is adapted slightly from David Lebovitz’s recipe for Nectarine-Berry Cobbler with Fluffy Biscuits in Ready for Dessert. His biscuit method is absolute genius – instead of cutting or rubbing butter into the flour mixture, he calls for grating frozen butter right into the flour before stirring in buttermilk. The butter gets distributed evenly in the dough, but remains cold so the biscuits bake to flaky perfection. Preheat the oven to 375 degrees F. Halve, pit and cut the peaches into ½-inch slices. In a large bowl, toss the peaches with the 4 tablespoons sugar, lemon juice, 1½ teaspoons flour, vanilla and blueberries. 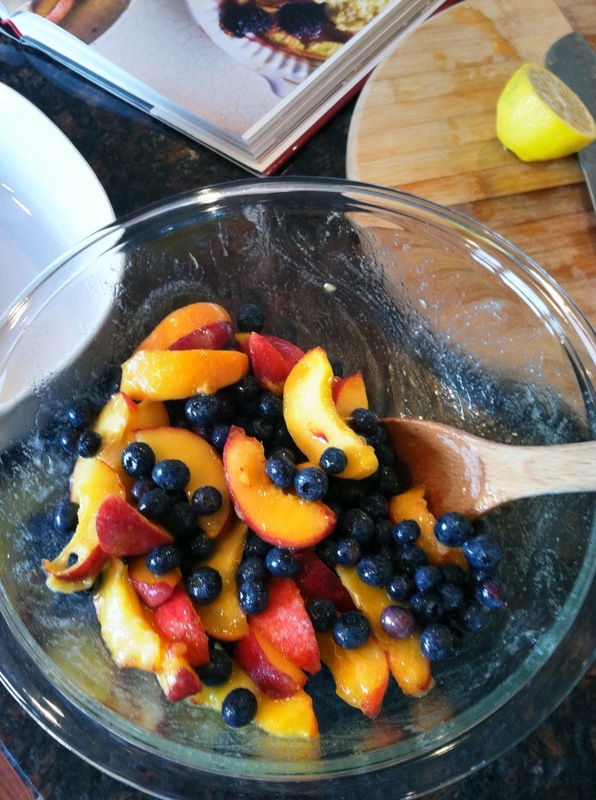 Transfer the fruit mixture to a shallow 1½ or 2 quart baking dish. 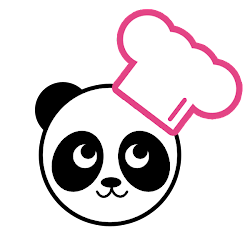 Bake in the preheated oven for 30 to 35 minutes, stirring once, until the fruit is warm and bubbly. Remove from the oven. While the fruit is baking, make the biscuit dough. In a medium bowl, whisk together the 1½ cups flour, baking powder, baking soda, 2 teaspoons sugar and salt. Grate the frozen butter on the largest holes of a box grater into the flour mixture. Stir just to coat the butter in the flour. Pour in the buttermilk and stir just until the dough is evenly moist. After the fruit has baked, drop the dough in six equally sized mounds onto the fruit. In a small bowl, whisk together the egg yolk and milk or cream. Brush the egg wash over the biscuit dough and sprinkle with coarse or granulated sugar. Return the baking dish to the oven for 20 to 25 minutes, or until the biscuits are golden brown. Serve the cobbler warm with vanilla ice cream, frozen yogurt, or whipped cream. Very nice blog!!! 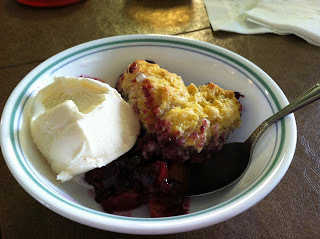 !I love Blueberry Peach Cobbler recipes.Thanks for sharing this information.